*A conversion is when a user performs a desired action (being tracked) on your website. This could be buying a product, downloading a file, clicking a link or any other desired action. Typically, conversions are linked either directly or indirectly to revenue. 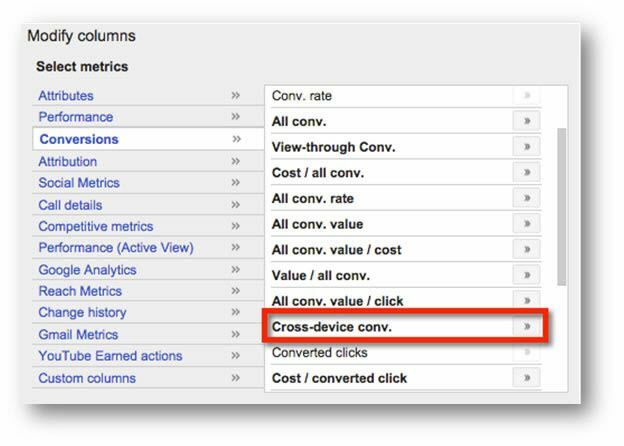 **Conversion tracking needs to be setup to see conversion data in AdWords. Referred to as = Cross-device conv. In today’s world we are a multi-device people, even non-tech-savvy people will often have a smartphone and laptop or tablet at home, they may even use a laptop or desktop at work. People stay connected, communicate, research and make online purchases across all of these devices. This metric tracks people that interact with your business on one device resulting from paid activity and then (at a later point) come back on another device to convert / make a purchase. This is tracked only if the user is logged into both devices and is consistent across both the Search and Display network. Depending on how you target your audience, how the audience behaves, understanding (where possible) the impact of one device on another can be very important. Although we are venturing into the realm of attribution here, there can be very good reasons for wanting to know how many people cross devices to convert. If your website / business sells products or services that are big purchases (expensive flights, home loans, high end consumer products, etc), the trend in user behaviour will likely be to make the purchase on a non-mobile device. Therefor understanding how many users begin research and have their first contact with your brand on a mobile device… because in this example, pausing or reducing the non-converting mobile traffic may result in a decrease in conversions for non-mobile device. Understanding you’re the path to purchase of your users is made easier through using this metric (and others) as it helps to determine where users are researching, where they are buying / converting; thus, this provides you with data you need to optimise that funnel, providing more relevant content and ads at each stage based on device. If the tick box is checked, you are all good and they are being tracked. This metric can be used on Search, Display, and Shopping campaigns.